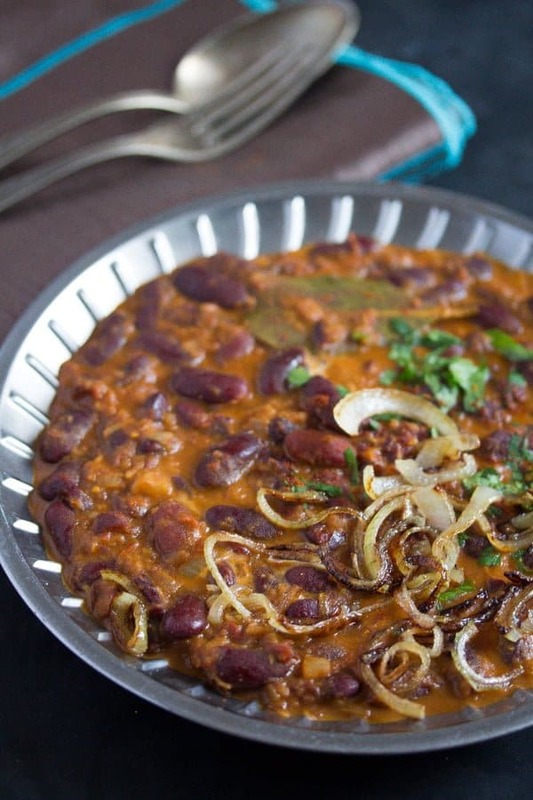 Learn how to make rajma – a vegetarian, spicy kidney bean curry topped with fried onions. Curry again? Well, yes. I love Indian food and I cook some curry or another so often… I just have to post some of those wonderful recipes, even if I am not Indian. 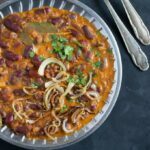 After the Paneer Tikka Masala recipe from a few weeks ago, now is time for a delicious and easy to make rajma recipe. And kidney beans again… I cooked a whole bag of kidney beans to make this Jamaican Rice and Peas recipe and used the leftover beans to cook this kidney bean curry, a bean salad and an Italian soup I will post soon. 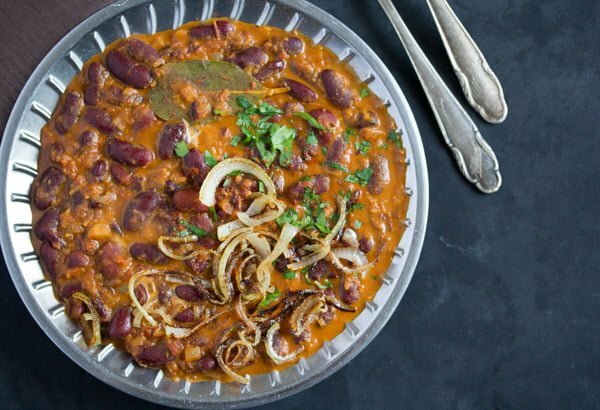 Rajma is an Indian kidney bean curry. The cooked beans are simmered in a thick gravy containing lots of spices. It is usually served with rice, which I suppose makes it the Indian version of the Jamaican rice and peas, the Costa Rican gallo pinto or the African waakye. When it comes to beans, I prefer to buy the dried beans and cook them myself. Not that I don’t use canned beans all the time. For a quick soup, salad or most anything, canned beans are perfectly fine. However, when cooking a dish where the beans play the main role, I prefer to take the time and cook dried beans. I think they have a better texture and taste, they are softer and more “buttery”. Not to mention cheaper, a whole bag of dried beans costs about as much as 2 or 3 cans of beans (depending on the sort), but you will have so much more beans for the same price. And I also like to use the cooking liquid from the beans. A bean soup made with the beans cooking liquid tastes much better than the same bean soup cooked with a vegetable stock cube or water. The same in the case of this kidney bean curry. 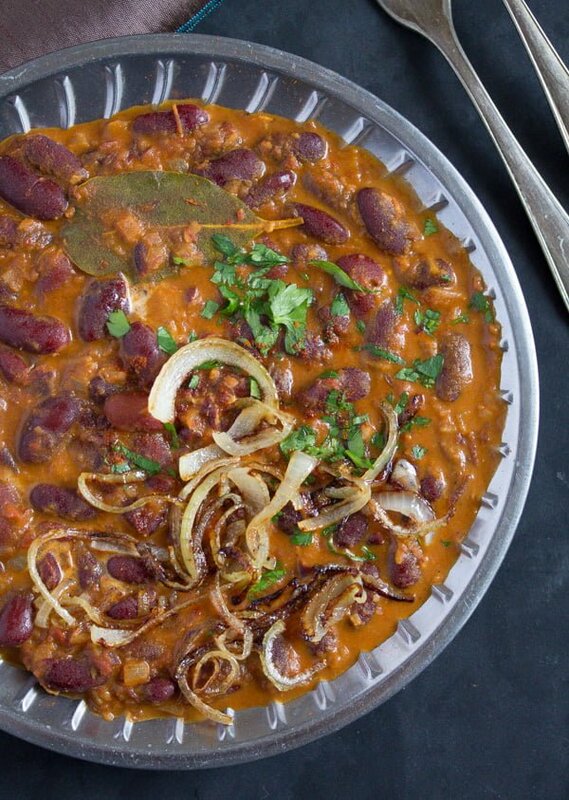 But how to properly cook kidney beans (or any other beans)? and give them to a very large bowl. Cover well with water, you should have at least 3-4 cm/ 1.1 -1.5 inches water over the beans. Leave to soak overnight. Drain the beans, give them to a large pot and cover with plenty of fresh water. Bring to a boil, let boil for about then minutes, turn the heat down and simmer the kidney beans for at least 45 minutes or until tender. But here is the thing, although most of the dried bean packages I have ever had, state that the beans should be tender after 45 minutes to 1 hour, I have always – and I really mean ALWAYS – needed more time for my beans, at least one hour for small beans and up to 1 hour and 45 minutes for larger beans. So, make sure you check the beans regularly and stop cooking them as soon as they are tender. Don’t overcook them either or their skin will break and the beans will become too mushy and disintegrate when added to other dishes.
. I miss mine, it died a few years ago… I definitely have to get a new one soon. 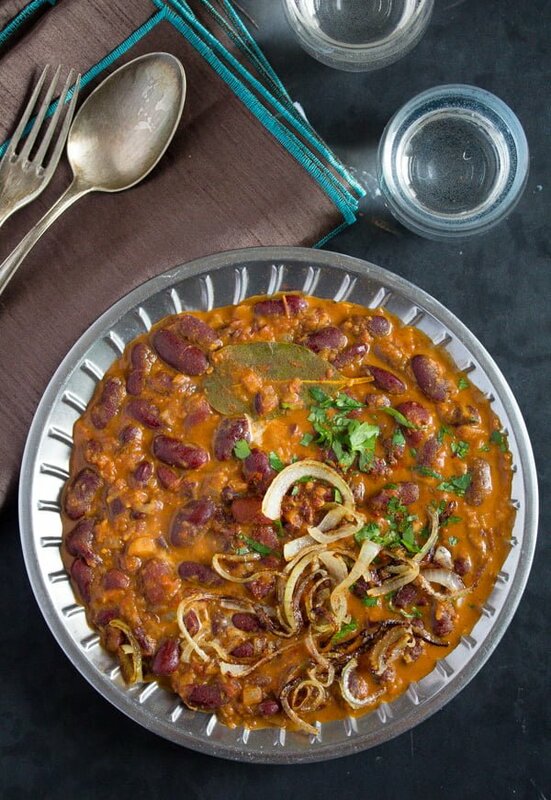 Cooking a good rajma recipe is pretty simple actually. You might think that the ingredient list is a bit long, but most of those items are spices. And if you cook Indian food from time to time, you probably have all those spices in your cupboard already. Step 1: Soak and cook the red kidney beans as described above. Drain and keep at least 500 ml/ 17 fl.oz/ 2 cups of the cooking liquid. until the onions are golden, about 4-5 minutes, stirring often. Step 3: Add the garlic, ginger and chili and stir briefly as well. , stir well and cook for about 10 minutes. The tomatoes should lose their raw taste. Step 5: Add the beans and the bean or vegetable stock (if using canned beans) and some salt. Simmer, uncovered, for about 15 minutes or until the dish is slightly thickened. Should it thicken too much (it can happen if your pot is too wide and the heat too high), add a little more stock. Step 6: Remove about 5 tablespoons beans from the pot. Puree them with a fork and give them back to the kidney bean curry. The pureed beans will help thicken the rajma. Step 7: Add the heavy cream and reheat the dish for about 1-2 minutes. Adjust the taste with more salt and just a little fresh lemon juice. The rajma recipe can be easily reheated. Serve topped with the fried onions and with basmati rice or naan bread. If using dried beans, soak them overnight in plenty of water. Drain, cover with water again, bring to a boil, boil for 10 minutes, then lower the heat and simmer for 45 minutes or longer until the beans are tender. Check after 45 minutes and adjust the cooking time accordingly. Drain the beans, but reserve at least 500 ml/ 2 cups of the cooking water. Finely chop the onions, grate the garlic and the ginger. Chop and puree the tomatoes in a small blender or with an immersion blender. Heat the oil and the butter in a medium saucepan. Cook the onions for about 3-4 minutes or until golden, stirring often. Add the ginger, garlic and chili flakes. Stir for about ½ minute. 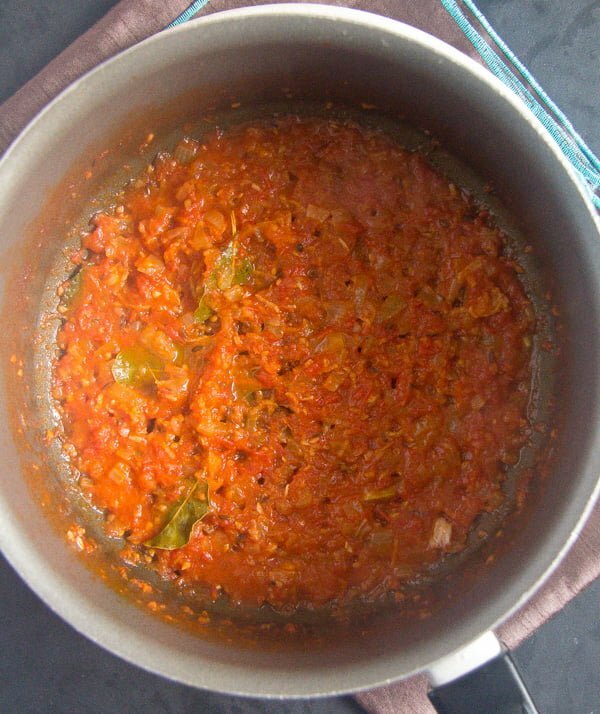 Add the pureed tomatoes, bay leaves, turmeric, ground coriander and garam masala, stir well and cook on low heat for about 10 minutes. Add the beans and the bean stock (or vegetable stock) and some salt. 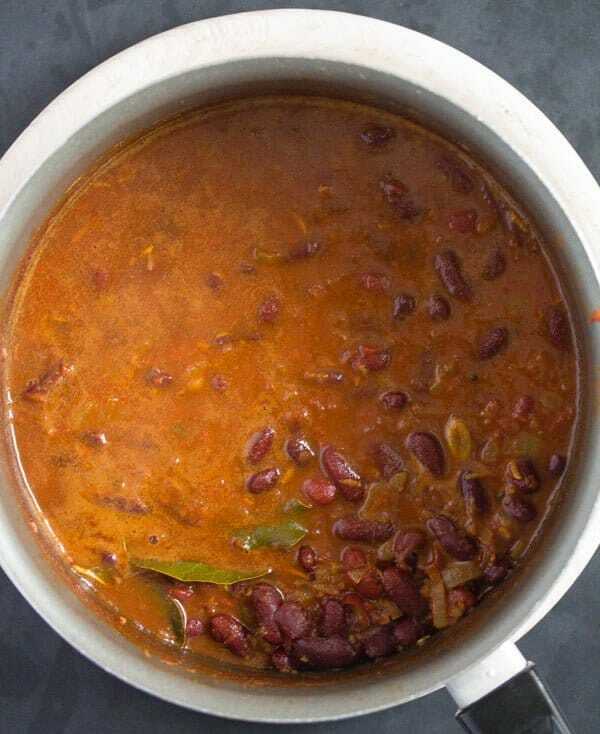 Simmer without a lid for about 15 minutes or until the rajma is slightly thickened. Meanwhile prepare the fried onions. See below for the recipe. Remove about 5 tablespoons of the beans from the curry. Puree them with a fork. Give them back to the rajma curry and stir well. Add the cream and reheat the curry for about 1 minute. Adjust the taste with a small amount fresh lemon juice and more salt. Serve topped with the fried onions and rice. Peel and halve the onions, cut the halves into thin slices. Heat the oil in a pan and fry the onions on medium high heat for about 4 minutes, stirring often. They should be golden and soft. Peel and grate the ginger. When the onions are golden brown, add the ginger and stir for another minute. Note 1: This amount of dried red kidney beans makes about 3 cups of cooked kidney beans. 2 cans of beans (each about 400 g/ 15 oz) yield more or less 3 cups of beans. That would probably be fine as well. I often use the curry paste, I find it even better than the powder. Adina, your Rajma looks so yummy. 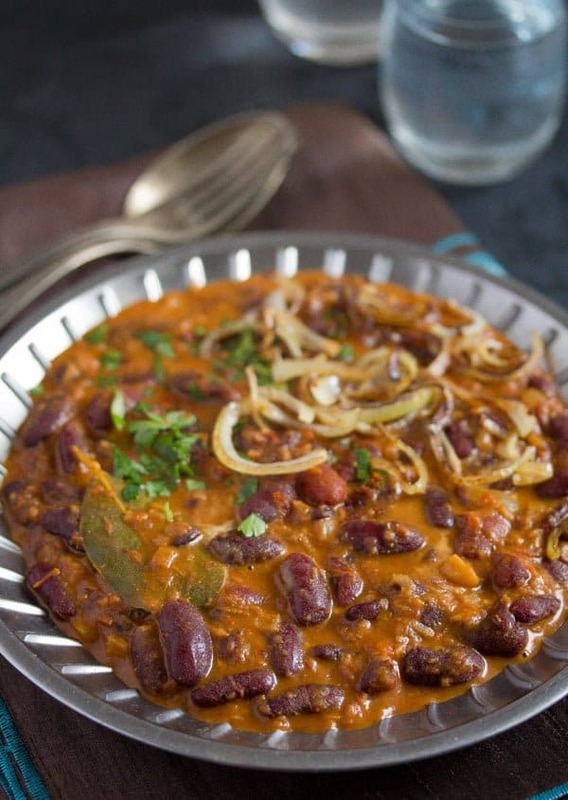 When I traveled in India I was introduced to this dish and remember thinking it was a bit like American red beans and rice with lots of spice. What a great use of the legume a favorite in our house. Thanks for posting as I can now cook a dish I experience in India in my home. Keep those curry dishes coming. Thank you, Ron. So many regions have their variations for rice and beans and I haven’t had one I didn’t like, it just work. But for sure the Indian rajma is the spiciest one. Love bean dishes, we have them often. I’ll be trying your version very soon. 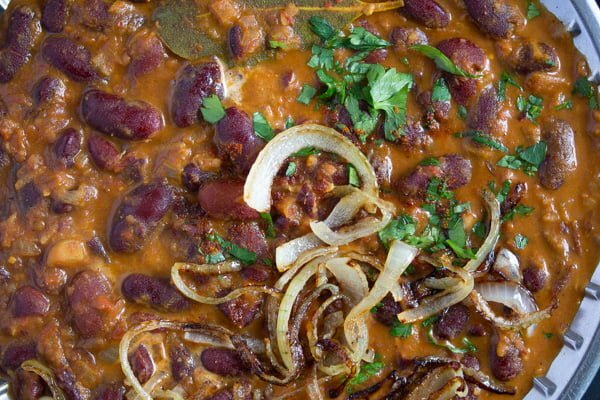 I love kidney bean curry and yours looks particularly delicious. Making rajma is actually the only reason why I buy kidney beans! I also always need much more time to cook them…. The rajmah looks fabulous, Adina! Its one of our favorite weekend lunch. I haven’t heard of Rajma before. This does sound really good, it’s something I’d like to try. with all the bean recipes I’ve made over the years, none of them have been an Indian dish. I can’t wait to make these beans. They look so good and we love Indian spices so what a perfect fit for our table. Thanks Adina!